Looking for some summer design conferences? Check out UXCamp NYC in June and the Design + Diversity Conference in August! Join Us June 15 in San Francisco for Vectors! Vectors is a half-day event during AIGA’s Design Week that explores identity in design and how it impacts work, communities, and the world at large. Vote for Our Presentations at SXSW! Big news! 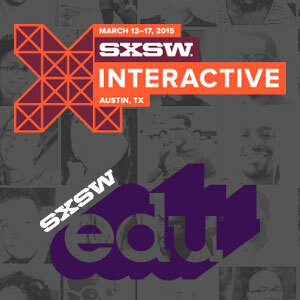 We have submitted two proposals for presentations for SXSW 2015 (Interactive and SXSWedu) and they are included in the SXSW PanelPicker! We need your help to make sure these presentations included in SXSW’s programming for next year. Public voting accounts for 30% of the decision-making process for inclusion, and it’s an extremely competitive process. So how can you help? By voting for our panels on the SXSW PanelPicker and leaving a comment! Here’s how to do it. Go to https://auth.sxsw.com/users/sign_in and sign in. If you do not have an account, click the “Create Account” link under that big blue button to create your free account. You will receive a confirmation email to activate your account. Once your account has been activated, enter your email address and password at https://auth.sxsw.com/users/sign_in and click the big blue “Sign in” button. You’re now on the main SXSW PanelPicker page. You can click the “Search/Vote” link to search for our presentation names, or visit our voting pages directly (see links below). Once you are on the voting page for the presentation, click the thumbs up icon to cast your vote. You can also leave a comment on this page as well (the more positive comments, the better). That’s it! Your vote has been cast for our presentation! Thank you! Voting ends on September 5, 2014 at 11:59pm CDT. Check after the jump for our presentation descriptions and links directly to the voting pages. What panels are you voting for to be included at SXSW 2015? Let us know in the comments! RSVP Today for CODE2040’s Fellows Program Celebration!